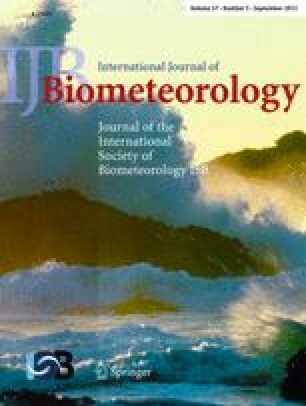 To examine the effects of age-related differences in thermoregulatory function on the clothing microclimate temperature (Tm) andTm fluctuations while maintaining thermal comfort in daily life, 5 boys (group B, 10–11 years), 5 young men (group Y, 20–21 years) and 5 older men (group O, 60–65 years) volunteered to take part in this study. The subjects were asked to maintain thermal comfort as closely as possible in their daily lives.Tm (temperatures between the skin surface and the innermost garment) at four sites (chest, back, upper arm, and thigh), skin temperature on the chest (Tchest) and ambient temperature (Ta) were measured over a period of 8–12 h from morning to evening on one day in each of the seasons, spring, summer, autumn, and winter. Records of ability to maintain thermal comfort and of adjustment of their clothes were kept by each subject.Ta during periods of thermal comfort did not differ among the groups in any of the seasons. In group Y,Tm was significantly lower at the thigh than at the other sites in spring, autumn, and winter (P<0.05) and fluctuations (CV) ofTm were significantly larger at the thigh than at other sites in autumn and winter (P<0.05). Similar tendencies were observed forTm and CV ofTm in group B. However,Tm and CV ofTm in group O did not differ by site except for the autumnTm. Group O had a smaller CV at the thigh in winter (P<0.05), compared to groups B and Y, suggesting a smaller regional difference inTm fluctuation in group O. Group O adjusted their clothes even on the lower limbs (together with upper body) in order to maintain thermal comfort in accordance with changes inTa, while groups B and Y did so only on their upper bodies. These results sugest that compared to boys and young men, lower thermoregulatory function in older men may affectTm and CV ofTm as a result of clothing on lower limbs being adjusted differently in order to maintain thermal comfort.